Xelas Energy is the dedicated division within Xelas Software for energy network management solutions. Energy networks increasingly need to be intelligent, and remotely managed. IEC-61850 is the globally widest accepted standard, offering a standard information model, all the required protocols, and a wide set of defined obligatory features. You may need to develop 61850 clients or servers, or want to test their standard compliance, or you may need to simulate 61850 systems or engineer their configuration. Xelas Energy Management (XEM) offers all required tools, products and/or libraries. Xelas Energy is a one-stop-shop for delivery, support, further development, customization, consultancy and training. About our parent: Xelas Software products are used all over the world, supported by world-class support and professional services. For over twenty years, our software had proven to deliver cornerstone functionality for network management, mediation and integration solutions for the telecom, aviation, messaging and energy networks. Xelas Software expanded established Vertel and Retix products through intense participation in industry collaboration, and offers management software solutions now widely used by market leaders such as Alcatel-Lucent, Nokia Siemens Networks (NSN), Motorola, Ericsson, IBM, NTT, NEC, Samsung and Huawei. We know how to successfully support them, we are proud on these relations lasting for over 25 years, due to our dedicated support staff in Europe, USA and Asia. All components in our portfolio are fully owned, developed and supported by Xelas Energy Software. This is of great importance to ensure effective support and performance management. We have no dependencies on third-parties when it comes to streamlining the communication to all the layers of the stack. Our mother company Xelas Software is a privately owned company, which acquired the software licenses and intellectual property of Vertel Corporation and Retix in 2004. MMS (Manufacturing Message Specification), the most widely used and complex smart grid protocol , has originally been implemented by Retix, but has been fully modernized and adopted by Xelas Energy. Xelas Energy has created a Partner Business model which provides excellent opportunities for System Integrators and Solutions vendors to get access to the XEM products. 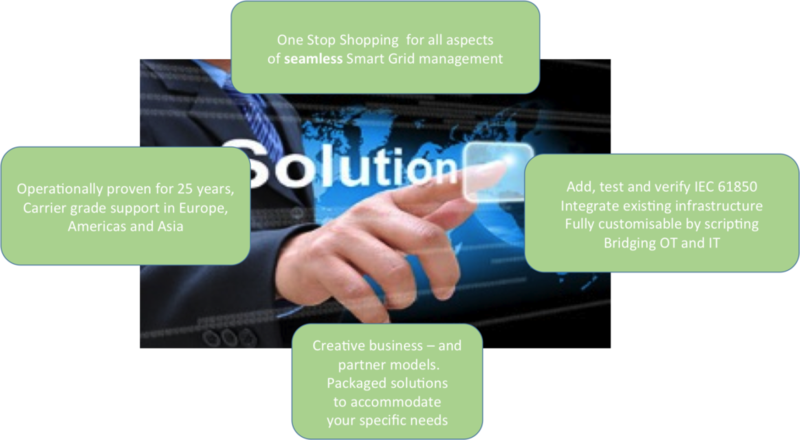 Specific Smart Grid applications can be built upon the XEM Platform which can provide the necessary 61850 and other connectivity needed within the Smart Grid architecture. The XEM overall system architecture supports IEC-61850 based network management and back-office information supply in a very flexible, fully distributed manner. The Xelas Energy architecture fully opens up all possibilities of the IEC-61850 standard, both as INFORMATION MODEL and MANAGEMENT METHODOLOGY. As INFORMATION MODEL, IEC-61850 enable the standard modelling of all data coming from the devices. This means that information coming from Distributed Energy Resources such as solar and wind and information coming from the intelligent substations is ALREADY formatted in a common way, which makes it easy to COLLECT them in a common database, for BIG DATA ANALYSIS. This way of using 61850 is fully translated in the XEM architecture: easy bonding to any embedded OS, standard performant drivers for embedded clients or servers, distributed client functionality, all information directly gathered in ANY open relational database system. Our architecture enables rapid development of application services. The complete solution is can be command, code or script based, depending on the system requirements of speed/performance or on high adaptability, enabling changes without bringing the systems down. Grid operators can enjoy seamless, reliable, carrier grade, flexible and streamlined grid management architecture, based on our twenty years of operations technology (OT) experience. Many of our customers told us about their concerns and challenges, integrating this network information into their business systems. How important it is for their business not to lose any network information. Offering complete network reporting and analyses, all enabled by a technical infrastructure that the operator himself can understand and adapt. While change management and maintenance is very easy, even without detailed specialist knowledge, its possibilities are so rich, that you may prefer our assistance in designing our packaged solutions. Xelas offers the professional services for turn-key solutions based upon the XEM Products. Download detailed product information on the Product Download page.